Part photo gallery. Part travelogue. Part diary. The weather’s been good for the past few days, so I was up pretty early this morning to head off up towards Rannoch Moor and Glen Coe. 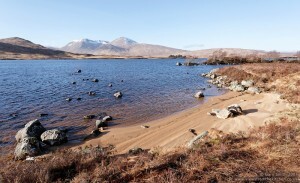 When you drive from Glasgow up the A82 to Fort William, you cross Rannoch Moor. Once you’ve made the ascent to the moor, you pass between two lochs in fairly short order. 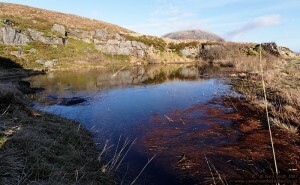 Little Lochan na-h’Achlaise is first on the left and then you pass the larger Loch Ba on the right. If you remain on the road, you see little of Loch Ba, while the views over Lochan na-h’Achlaise are much better. I took a short break in Fort William last spring (note to self – I really must get some of my photos from that trip posted here!) and crossing the moor that time, I merely stopped and shot a couple of frames from the roadside. My excuse was that it was really windy and cold; the stop had not been planned and I was quite late getting away from Glasgow. 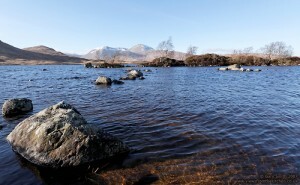 This time, however, Rannoch Moor featured at the top of the schedule. After stopping at the same place as last year, I walked across the moor and down to the waterside. Some of you will be familiar with the expression “take nothing but photographs, leave nothing but footprints” and might be wondering if I obliged and left my mark on the sand. I didn’t – I skirted the beach by squelching around the raised ground. I felt it would have been sacrilege to desecrate the wild beauty of the scene. This second shot is taken from a little further on round to the right from the previous shot. For the final shot in this set, I returned to the car and drove on to the other side of the moor. Now you’re on the approach to the famous Pass of Glen Coe. This was taken across the road from a parking spot just beyond Altnafeadh which, in its turn, is about three miles beyond the Kings House Hotel. This is the view looking back approximately east. The road is on the right hand side here and is only just cropped out the final image. If you look closely, you can see a thin layer of ice over most of the pond’s surface. Footnote After this leaving this location, I stopped briefly along the Pass of Glen Coe, but the light was unsuitable for decent photographs due to the position of the sun in the sky at the time. After that, it was back on the road for the final short drive to the Ballachulish Visitor Centre to get something hot to eat. I’ve stopped there before and I enjoyed my snack this time – a bowl of soup, followed by coffee and a bit of their home-baking – as much as I did the last time. If you’re going to give them a visit based on my recommendation, try not to leave it too close to closing time – I suspect that they’ll not have much fresh produce left and you might be disappointed. This entry was posted in EOS 350D, Photographs, Scotland and tagged A82, Coe, Glen, ice, Lochan, Moor, na-h’Achlaise, Rannoch. Bookmark the permalink. Copyright © 2005-2010, Gary Smith. All Rights Reserved.